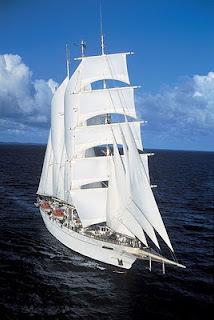 The luxury sailing ship Star Clipper will call at 15 ports in seven countries on a rare 35-night cruise from the Caribbean to Athens in April/May next year from $8700 per person. Passengers with limited time can buy segments of the cruise: 18 nights across the Atlantic from St Maarten to Lisbon, Portugal (from $3160); 10 nights Lisbon to Malta ($4440) and seven nights Malta to Athens ($3029). The Lisbon/Malta and Malta/Athens legs will be discounted by 35% for bookings before January 31. Ports of call also include Ponta Delgada in the Azores, Tangier (Morocco), Motril, Palma de Mallorca and Mahon (Spain) Tunis (Tunisia) Pantelleria and Siracusa (Italy) Katakolon, Monemvasia, Mykonos, and Hydra (Greece). Fares include all meals and entertainment on board, port charges and taxes. Star Clipper, which carries a maximum 170 passengers in the style and ambience of a private yacht, leaves St Maarten on April 9 and arrives at Piraeus (the port for Athens) on May 14. Sister ship Star Flyer will make a 28-night cruise across the Atlantic from St Maarten on April 2 to Monte Carlo from $7060. Ports of call include Ponta Delgada, Lisbon and Portimao (Portugal) Tangier (Morocco) Motril, Cadiz, Ibiza and Palma de Mallorca (Spain) and St Tropez. Segments of 18 nights ($3160) and 10 nights ($4440) are available. Royal Clipper, flagship of the clippers fleet, will launch its European summer eason with a seven-nights cruise Lisbon to Barcelona Cruise on April 23. Fares tarting at $3189 will be discounted by 35% for bookings a before January 31.